Detective Conan is a Japanese mystery manga series It has the anime version aired on Yomiuri TV. Since it’s very popular among Japanese people, The TV broadcaster and so on release its anime movie every year together and the title of this year is “Detective Conan: Sunflowers of Inferno”. The theme is Sunflower drawings of Vincent van Gogh. I couldn’t find which is the special guest star’s voice till the last part. I wondered how prestigeous Teitan High School is. Sonoko tells the press release in NY or so. So she might speak English very well. Since I always see Kaiun Nandemo Kanteidan(A Japanese TV show like Antiques Roadshow), van Gogh’s drawing is too expensive. Jirokichi paid 300 million USD for one. But it’s very rare that Kanteidan estimates more than 10 million yen. (About 84,000 USD) So the order of the drawing’s price is 10^3 times expensive to Kanteidan’s very rare antiques. It has a scene that Kid the Phantom Thief or so blasted the airplane. If it isn’t a terrorism, it’s a major crime like terrorism. It reminds me of that. I feel it funny that the special art museum for those van Gogh drawings is settled in a limestone cavern. I feel it very possible that such a cavern is protected by environmental law. The criminal of the DC movie may be usual characters among passionate researchers… It is said that scholars are often strongly opinionated. I translated a famous copy-and-paste literature about Kindaichi Case Files. Although I cannot watch the paid channels, I found that ファミリー劇場 shows Kindaichi Case Files. (I wish that I could watch those shows on free channels. But the most of good shows are on the paid channels…) It reminds me of the text on http://2chnull.info/r/rcomic/1301140232/505 . So I translated it for showing a friend on the net. This is the translation: Continue reading I translated a famous copy-and-paste literature about Kindaichi Case Files. Posted on August 21, 2012 August 21, 2012 Categories UncategorizedTags mangaLeave a comment on I translated a famous copy-and-paste literature about Kindaichi Case Files. I watched Kurosagi and a movie of Detective Conan on Sunday. And this movie reminds me of Nodame Cantabile, as I posted an entry. So I link these 13 websites about them. I watched Kurosagi the movie (映画 クロサギ) today, too. Kurosagi is originally a manga serialization by Kuromaru and Takeshi Natsuhara on Weekly Young Sunday (週刊ヤングサンデー). It was made into a TV drama from 14 Apr. to 23 Jun. in 2006 and the movie is the sequel of the drama. Kurosaki, the hero of it is a swingler burning up only cons. In TV shows, he has clients in all cases but in the original, not in all. In the original, as he does in TV shows, he buys information from Katsura, the fixer of swingler society. Katsura is the planner of fraud leading Kurosaki’s father to family suicide. So Kurosaki, himself is a victim of fraud and he’s become one for revenge on all cons but he needs Katsura. In all versions, Kurosagi looks a sort of Mission Impossible since all episodes show interesting tricks. The episode of Kurosagi the movie, too. It is based on the original serialization, too, as the all episodes of the TV drama version. One swingler’s con smashed up many corporations to damage Japanese economy itself. So Katsura whip him by Kurosaki. I’d read the original episode when I watched the movie but probably you can enjoy much more without reading it. Today, I watched Detective Conan: Full Score of Fear (名探偵コナン 戦慄の楽譜), which is the movie of Detective Conan in 2008, this year. 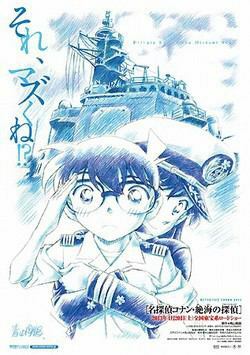 Detective Conan is originally a mystery manga serialization by Gosho Aoyama (青山剛晶) on Shonen Sunday (少年サンデー) and the anime based on it. I like mystery. So I watch every movie of Detective Conan. One big theme of the movie is classical music. So it reminds me of Nodame Cantable (のだめカンタービレ), the live drama based on the honomymous manga by Tomoko Ninomiya (二宮知子) since it was a drama about classical music on air in 2006. I watched its repeat several times in 2007. I hear that it influenced the popularity of classical music in Japan. So I felt the possibility that it influenced Detective Conan, too. “Case Closed” is the American title of “Detective Conan”, the most famous Japanese mystery manga and animation of Japan. Its first season was on air in USA. So it had the official website. Seeing that, the names of characters are changed in the American version. Shinichi Kudo is Jimmy Kudo in it and Ran Mouri is Rachel Moore. What do you think of it? And I hear that it was on air at night since the anime includes many homicides in context. So children there couldn’t watch it.